The week-long Passover holiday can often end with a fizzle, but Moroccan Jews know how to let it go out with a bang — with music, drums and sequins, and lots of sweets and leavened pastries, of course. That’s Mimuna, the holiday our newspapers love to cover and our politicians love to attend. My first Mimuna was at the home of my friend Renee’s grandmother, in Kiryat Gat. A small, hunched woman with a twinkle in her eye, she’d raised 11 children and with the same energy had prepared enough sweets to feed the entire neighborhood. When we arrived, we found her in the kitchen, kneading a huge mound of dough for mufletas — the leavened crepes eaten as night falls after the last day of Passover, and the star of the Mimuna celebration. The coolest thing about mufletas is that they’re baked in stacks in a pan. The stack grows as you work — the newest mufleta is spread gently on top, and whoop, you flip the entire thing to expose it to the heat. It’ll be fried only on that one side, and as it cooks, you have just enough time to prepare the next one — stretching out a ball of dough into a thin, translucent circle that is next in line to be placed on the bottom-top of the stack. Once your stack is high enough to be unwieldy — or once you’ve gone through all your dough, presuming you aren’t feeding 11 children and countless grandchildren — you take it off the pan, spread each warm mufleta with honey and butter, fold it up, and eat it warm. There’s no better way to end Passover. Despite what some people have tried to tell me, you don’t have to be a Moroccan grandmother to make mufletas. Your mufletas probably will be more even and nicer looking if you are, but that’s merely a matter of practice. Don’t worry if your first two (or 20) aren’t perfectly thin and happen to tear — they’ll still taste good. These quantities come from a recipe by Doram Gaunt, but they’re pretty standard — in fact, they’re half your average recipe, which generally calls for a full bag of flour, and then easy-to-measure quantities (i.e. tablespoons) of sugar and yeast. You want to add enough water to create a soft, elastic dough, since it needs to be strong enough to be stretched out thinly. As a bonus, if you have too much dough and/or get tired of making mufletas, you can deep-fry anything left over to make sfenj, Moroccan donuts. The mufletas themselves are vegan/parve; the honey and butter toppings make them dairy. In Israel, Passover is ending in a few hours; in other countries, it’ll be ending tomorrow night. If you start right when the holiday ends, you can have these ready within two hours. Combine the flour, sugar, salt, water and yeast. Knead and let rise until doubled in size. 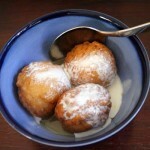 Break off golf ball-sized lumps of dough, roll into balls and dip into oil. Let rise again until doubled in size. On a flat surface, take one ball of dough, flatten, and using your fingertips, stretch into a round, flat disc. You want the dough to be thin, and somewhere between the size of a dinner plate and an appetizer plate. Ideally the dough won’t tear, but it’ll still taste good even if it does. Heat a frying pan, and lay the flattened dough into the pan. Let cook for a minute on one side, until it dries slightly, and then flip — this will be the only mufleta that touches the pan on both sides. Meanwhile, flatten another dough ball. Lay the second flattened dough ball on top of the first mufleta in the pan. Slip a spatula under the little stack, and flip it. Now, the first mufleta will be on the top, and the second, uncooked mufleta will be touching the pan. Meanwhile, flatten another dough ball. Lay the third mufleta on top of the stack in the pan — it will be lying on top of the first mufleta you made. Slide a spatula under the entire stack and flip, so the uncooked dough is again touching the pan (and the second mufleta is now on top). Continue like this until either the dough is gone or the stack becomes unwieldy (if the latter happens, remove it from the pan and start a new stack). 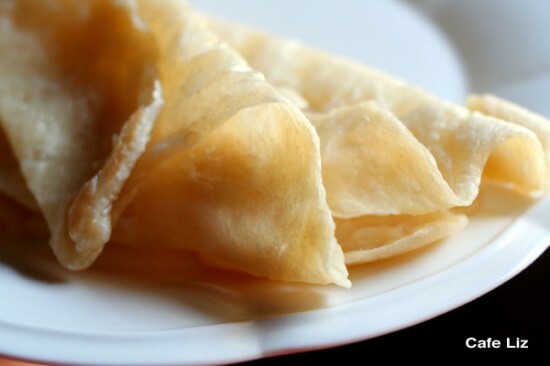 To serve, spread the hot mufletas with butter and honey, and fold into quarters. They’ll get warm, drippy and gooey. 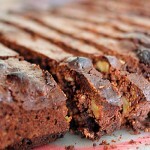 Here’s another very interesting mufleta recipe by Nisrine at Dinners and Dreams. I’ve never seen mufletas made this way, but clearly it’s another tradition. 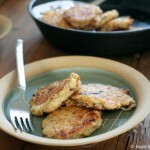 8 Responses to "Mufletas — the best way to end Passover"
Happy Mimouna! 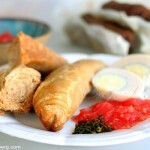 Too bad I don’t have a Moroccan grandmother to bake me mufleta, I sure feel eating them right now. I second what Sarah wrote! But thanks for making mufleta look so easy. The photo is beautiful and I like that is shows the texture so clearly. 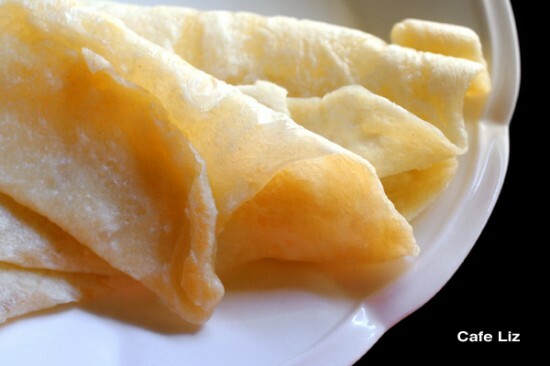 Would you say the consistency of the dough is similar to jachnun dough? To flatten it, do you use your hands or do you like to use a rolling pin? Thanks guys! Yes, jachnun dough is a good comparison, since you flatten it out the same way — pressing gently with your fingertips — and try to get it nearly as thin. I used to have Moroccan neighbors that really did have Pesach go out with a bang, they used to shoot off fireworks in their garden on Mimoona night. At midnight! No one ever called the police because the food was so good! I once had a Moroccan boyfriend. When the relationship looked like it might become permanent (it didn’t), his mother was so scared I was going to poison her baby with gefilte fish she had me in her kitchen every Friday teaching me how to cook proper food. She taught me how to make mufleta and I had so much fun flipping them, watching the stack grow higher and higher. She taught me how to make them and I taught her to eat them with Nutella. I think we both lucked out there! Nice looking mufletas:) I have had them only once,like 7 years ago when living here with my ex,and we visited the family of one his friends, Moroccan.Got a good explanation to all things related to Mimouna then,but I must say I was not so crazy about the mufletas…. These look great. We’re having a belated mimouna celebration here in Boston this weekend and I plan to attend — can’t wait to try mufletas and to possibly make them myself. Beautiful mufletas, Liz. Thank you for kindly mentioning my version. now i understand what all the mufleta talk is about.